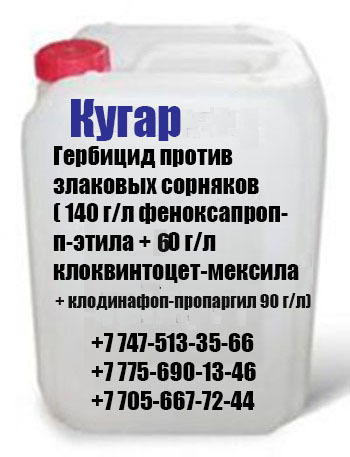 ALL.BIZ Kazakhstan Kazakhstan products Agricultural Soils, fertilizers and plant protection products Means of plants protection Herbicides Herbicide Kugar K. E.
Selective herbicide for poslevskhodovy processing of wheat against a wide range of cereal weeds. KUGAR K.E is absorbed by land bodies of plants within 1-3 hours after application and collects in growth points. At the biochemical level herbicide inhibits biosynthesis of fatty acids in meristemny fabrics of cereal weeds, interfering with formation of cellular membranes in growth points that leads to the termination of growth and death of a weed plant within 2-4 weeks depending on the developing weather conditions. In the majority of experiences when using herbicide Kugar on crops of spring-sown field the arrest of development of cultural plants is noted. In order to avoid emergence of resistant biotypes of cereal weeds it is recommended to alternate in a crop rotation use of herbicides from the different chemical groups differing on the action mechanism. Let's combine with the majority of herbicides (in particular, with medicines on the basis of the following active ingredients: 2,4-D air, MTsPA, amidosulfuron, bromoksinit, klopiralid, diflyufenikan, fluroksipir, izoproturon, tifensulfuron-marked, triasulfuron, metsulfuron-marked), fungicides, insecticides, the regulators of growth and mineral fertilizers applied on grain crops. In each case preliminary check on chemical compatibility of the mixed components is necessary. At preparation of tank mixes to avoid direct mixing of medicines without preliminary cultivation by water. Class of danger to bees - 2 (maloopasen). At application it is necessary to observe the following ecological time limit: to carry out processing of plants at a speed of wind up to 4-5 m/s; a boundary and protective zone for bees - more than 2-3 km; restriction of summer of bees - 3-4 hours. Use of medicine in personal subsidiary farms and in a sanitary zone around fishery reservoirs at distance of 500 m from flooding border at the maximum standing of flood waters is forbidden, but 2 km from the existing coast are not closer. Spraying is carried out to a windless clear weather in morning or evening hours, providing uniform spraying of a surface. The interval between processing and possible loss of rainfall has to be not less than 3-4 hours. Order of preparation of working liquid: before work to check purity of a tank, hoses and sprays, and also availability for service of all spraying equipment. Then to define quantity and uniformity of water supply through sprays and to adjust consumption rate of liquid on hectare. Working solution prepares just before spraying. Measure the required amount of medicine on one gas station of a sprayer. For preparation of uterine solution of medicine the capacity (bucket) is filled on ½ water, then add the measured amount of herbicide, carefully mixed, added water. Further the tank of a sprayer is filled approximately half with water, pour in it in uterine solution of medicine, added water up to the full volume at continuous hashing of solution sprayer mixers. Rinse several times water the capacity in which uterine solution prepared, and pour out contents in a sprayer tank. Working solution and gas station of a sprayer it are produced on special platforms. Cleaning of a sprayer: cleaning of sprayers is recommended to be carried out directly to the field right after completion of works. Order of cleaning of a sprayer: to empty a tank, to wash out a tank, a bar and hoses clear water. To remove all visible deposit. To remove and wash out sprays and grids. To rinse a tank, a bar and sprays with clear water. To store in the dry room intended for storage of pesticides at a temperature is not lower - 10 0C and not higher than +30 0C.